This is my cycling coach when I was racing – too long ago. Every week, he would tell us, his voice stern, serious and ernest, “You have to spin your gears. Always spin your gears”. Forty years later, I can still hear him preaching that simple message. Photographer’s notes: A European who had resettled in this corner of Canada, he was a real connection to bike racing. In a time when we few racers actually knew of, and idolized, Eddy Merckx, he would listen to the Tour de France stages on his shortwave and scream out developments as riders attacked, jerseys floundered, underdogs surged to the fore. In coaching, he convinced us that spinning gears was the best way to ride. When everybody else was riding at 80 rpm, we would be at 90-100 rpm. It meant our legs tired slower and we always had an extra gear to use when the going go tough. To this day, I spin my gears. I am always a gear or two under my cohorts on a ride and I always have that little more to pull out and use when the need is there. Spin your gears… If I learned nothing else. 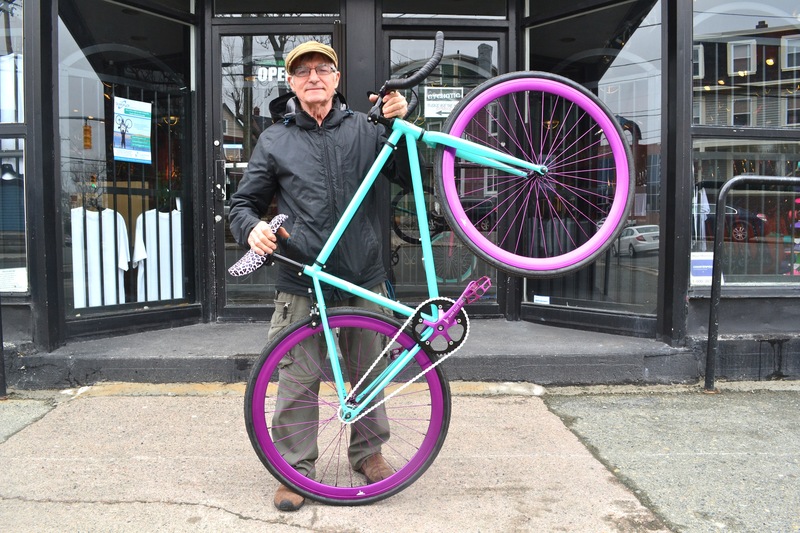 This entry was posted in advocacy, bike shop and tagged 2015, Canada, coaching, June, Newfoundland, St. John's. Bookmark the permalink.